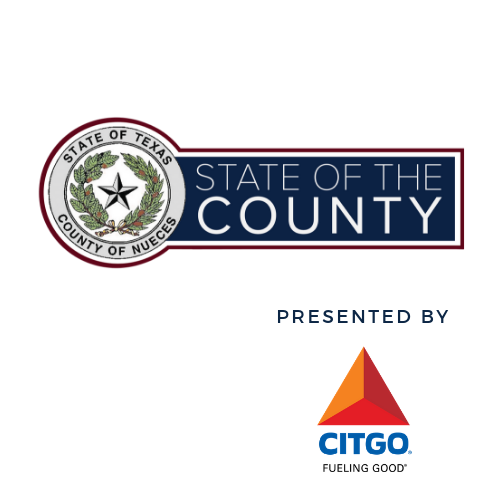 Join the United Corpus Christi Chamber of Commerce and Nueces County Judge Barbara Canales for the 2019 State of the County Address, presented by Citgo. You don't want to miss this highly-anticipated event where Judge Canales will present her first State of the County Address to the citizens of Nueces County and share her exciting goals, vision and outlook for the year ahead. Thank You 2019 State of the County Sponsors! Silver: Braselton Homes; CHRISTUS Spohn Health System; Frost Bank; HALO-Flight, Inc.
2019 Signature Events Season Pass Holders: Boys & Girls Clubs of the Coastal Bend; Coastal Bend Home Builders Association; Charter Bank; Dr. Mary Jane Garza; FASTSIGNS; Holt Cat; IBC Bank; NuStar Energy | Central West South Region; State Representative Todd Hunter; Stripes; Texas State Aquarium; USS Lexington Museum on the Bay; Workforce Solutions of the Coastal Bend; ZJZ Hospitality, Inc.
Sponsorships for the 2019 State of the County Address are still available! For more information, click here. A limited number of sponsorships are still available! Secure your State of the County sponsorship before April 24 to plan ahead and SAVE. Tables & sponsorships for this event will increase in price after April 24. (C2C Campaign pricing extension exclusively for State of the County.) CLICK HERE to view all available options or contact Gargi Bhowal at gargi@unitedcorpuschristichamber.com.